Make your cheap, naturally-invigorating drink a source of hostility! 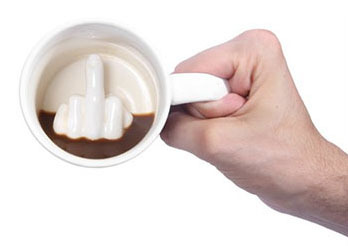 Try bringing this “middle finger mug” to work so you can flip yourself the bird while you’re trying to swallow enough caffeine to drag yourself through your soul-crushing daily routine. If you can’t stop the entire rest of the world from giving you the finger on a near-constant basis, I guess you can join them by flicking yourself off, to prove you’re one of them. Hey, look, I agree with you! I hate me too!